Notable Northies – Stevie is ‘great thanks’! Stevie was a fit young fella in those times, riding to the games both at the Northern Oval or the Eastern or City Ovals on pushbike from Learmonth Road. Stevie’s Dad was a psych nurse and worked long shifts as well as extra part time work. Time off for his Dad was precious and Stevie loved what family time they had together. Stevie started off his working life at Franklin Caravans making the windows and at J & G Darks making wheat silo’s. He finished up his working life at various car yards in Ballarat detailing cars. All this time he stayed living at home with his Mum and looked after her until his Mum passed away. Life around the football club is what Stevie loves, he enjoys feeling involved and useful. He has made friends and met lots of people while at the club and volunteering allows him the chance to give something back to the club that has welcomed him so much over the years. The North Ballarat Cricket Club also benefits from Stevie’s help and for many years he manned the scoreboard and updated the scores manually, also making sure the scores got into The Ballarat Courier on time. Now Stevie helps with the property like he does with the football club. Making sure we have everything we need for training and game day. 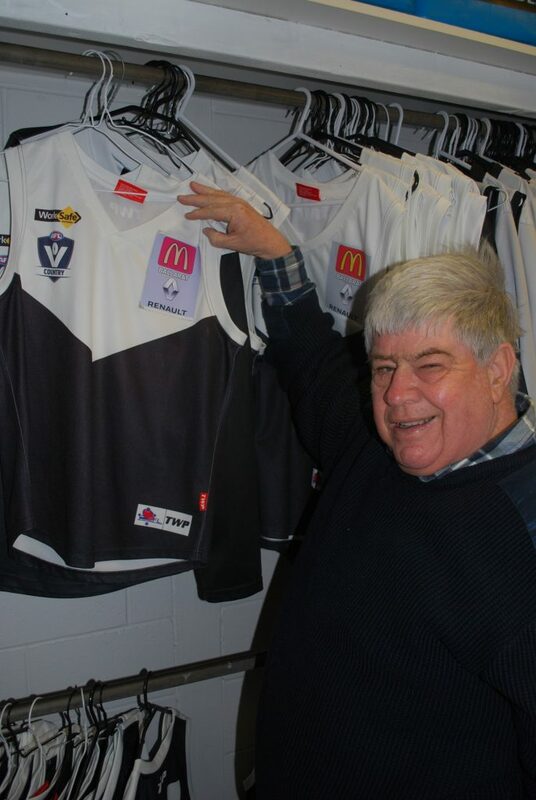 Stevie can remember so much of the club’s history and the development from an old airforce shed with a woodshed, potbelly stove and cold showers to the magnificent facilities the club shares today. The oval was in a different spot with the goals facing Howitt Street and the winds offering a 10 goal advantage. A long, narrow oval with a trotting track around the outside, it was a ground that was difficult for everyone to play on, not just the opposition! There have been many changes at the club and in football since Stevie started here. He has no favourite players from the long list of North’s alumni and can’t imagine following anyone else. He recognises the increased involvement of women in football during this time, remembering fondly the original ‘Ladies’ committee who worked so tirelessly and hard for the club in it’s earlier years. Now there are ladies involved in all levels from players to support staff. From the club’s perspective, volunteers and supporters like Stevie are so important to the continuing success of the club and we hope he keeps getting up at sun up on game days and filling up the water bottles on training nights for some years yet. We would be lost without him.